Now 700mg! Barlowe's Herbal Elixirs now brings you Organic KSM-66 Ashwagandha Extract which is widely considered to be the finest Ashwagandha in the world. This is a potent extract containing 5% Withanolides by HPLC. Ashwagandha, oftentimes called "Indian Ginseng," is an exotic Indian ayurvedic herb and adaptogen with many health benefits. Bottled in Glass! No Stearates! No Fillers! No Junk! Now 700mg! 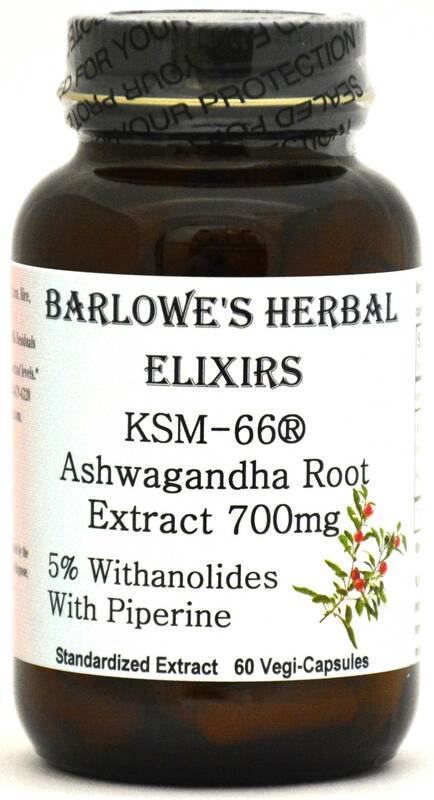 Barlowe's Herbal Elixirs now brings you Organic KSM-66 Ashwagandha Extract which is widely considered to be the finest Ashwagandha in the world. The COA is shown above. 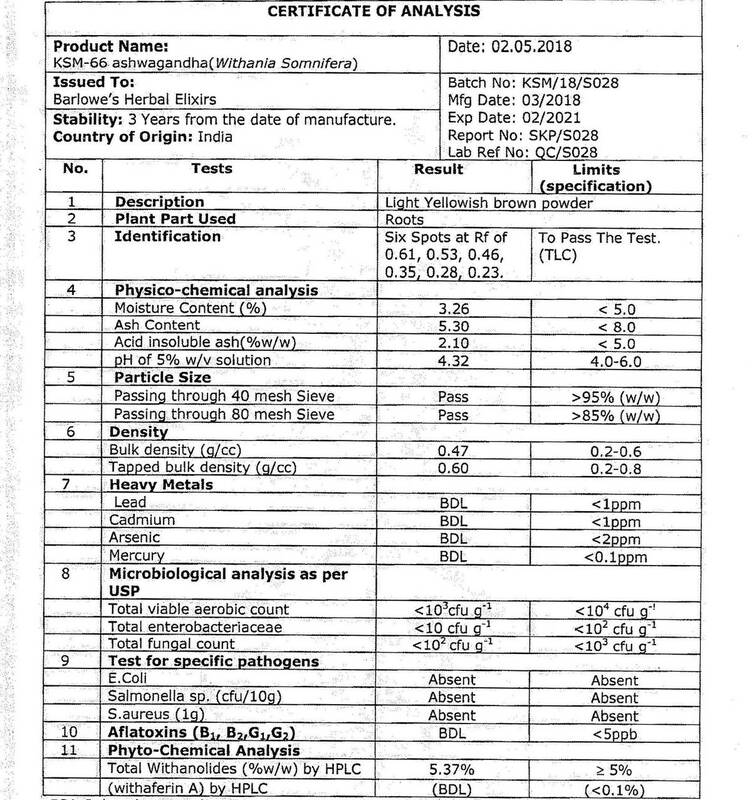 This is a potent extract containing 5% Withanolides by HPLC. Ashwagandha, oftentimes called "Indian Ginseng," is an exotic Indian ayurvedic herb and adaptogen with many health benefits. This product also contains 5mg of piperine (black pepper extract per capsule) to increase bio-availability and absorption. Allergen Warning: This Ashwagandha is extracted in the traditional manner after the roots have been soaked in milk. Thus, there are some milk residuals in this product. Bottled in Glass! No Stearates! No Fillers! No Junk! 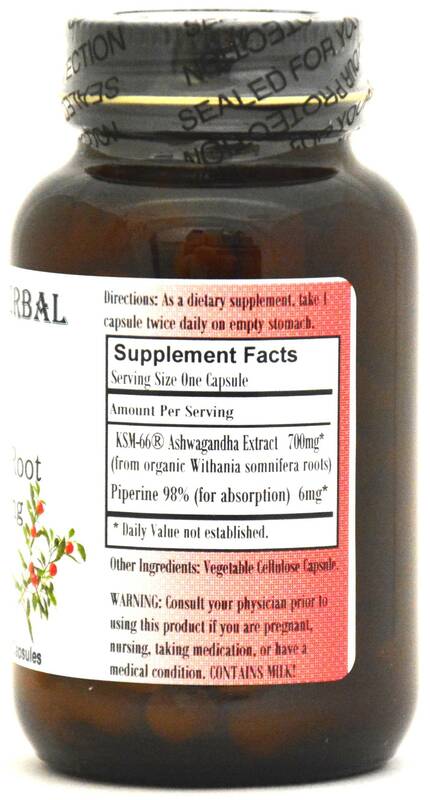 Ashwagandha has been utilized in Indian medicine for thousands of years. It is used in ayurvedic medicine similarly to how ginseng is used in traditional Chinese medicine. In Ayurveda, Ashwaganda is considered a rasayana herb which works on a nonspecific basis to support good health. Caution: This Extract is generally safe, but it is potent and should be utilized with care. This product is for dietary use. If side-effects occur, discontinue use immediately! The above statements have not been evaluated by the Food and Drug Administration (FDA). This product is not intended to diagnose, treat, cure, or prevent any disease. Allergen Warning: Milk is utilized in the extraction of this product, so some milk residuals may remain. Directions For Use: As a dietary supplement, take one or two capsules either once or twice a day on an empty stomach. Results and usage amounts may vary based on body type and weight.